One of the consequences of the First World War was the Russian Revolution. The current issue of the Claremont Review of Books has reviews of new biographies of both Lenin and Stalin. From the latter: "Blood-Soaked Monster." 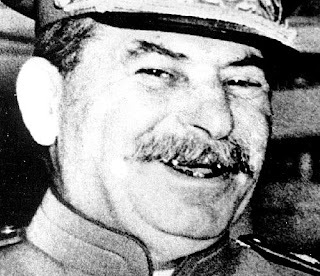 In August 1939 Stalin, who had been negotiating a collective security pact with Great Britain and France, suddenly performed an about-face and signed the infamous Molotov-Ribbentrop Pact with Hitler. Why? Half blinded by the purges, which had eliminated much of Soviet foreign intelligence and the Soviet diplomatic corps, he relied on his ideological worldview as he played what Kotkin calls “Three-Card Monte.” This was a triangular game of bluff among Hitler, Stalin, and Britain’s Neville Chamberlain to steer when and where the coming war would begin. Stalin’s aim was to entangle Germany and the Western powers into a long conflict from which he might benefit. To pick which side he would ally with Stalin held an “auction for spheres of influence in Eastern Europe.” Hitler won.